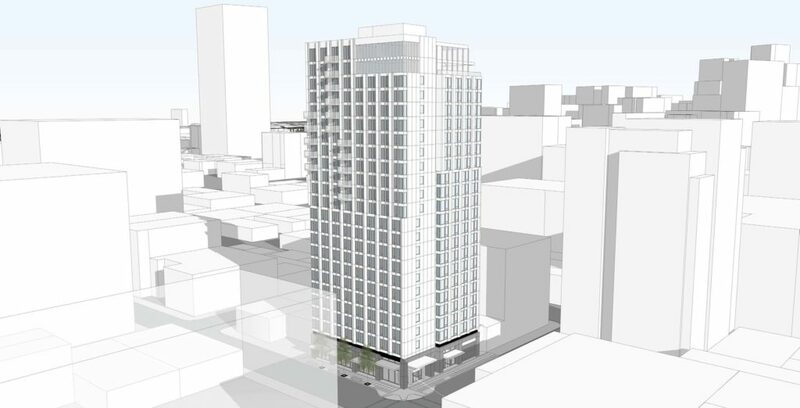 A proposed 23 story tower in the Pearl District has gone in front of the Design Commission to receive Design Advice. The project is being developed by Vibrant Cities in partnership with the Sunray Group, with design by Otak. The lower 11 floors of the 250′ tall building would be occupied by a Hyatt Place branded hotel. The upper 12 floors would be residential, with 120 apartment units. No vehicular parking is proposed.